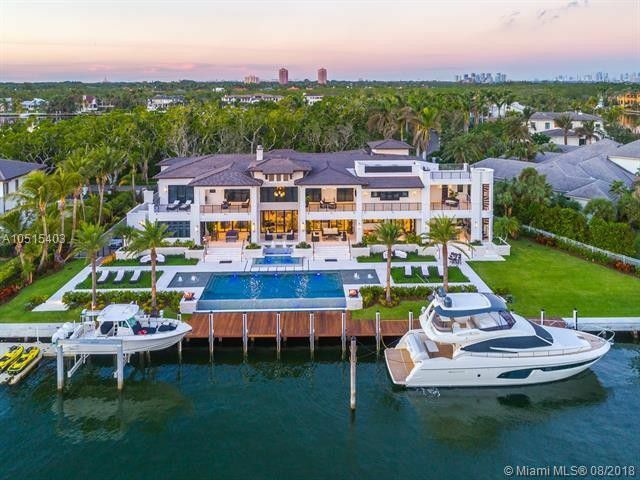 According to the listing, the property is “The most stunning home in the exclusive guard-gated community of Gables Estates.” It affords a whopping 255 feet of water frontage with 160-foot dock nestled on the widest part of the canal just few a seconds from the bay with direct ocean access. Built in 2017, the nine-bedroom, nine-full-and-three-half-bathroom estate includes lush and vibrant gardens, exceptional views of the waterway, and an impressive master suite overlooking the water with a spa-like marble bath and outdoor shower. A home theatre with 14 seats comes complete with optic ceiling lighting, while the oversized game room offers a wet bar and wine cellar. And nothing compares to the indoor-outdoor lifestyle this home affords! Here you’ll enjoy the luxury of a summer kitchen with gorgeous Teppanaki table, stunning covered terraces, a rooftop deck, and infinity-edge heated pool with fire bowl and fountains. For those looking to splurge on a private waterfront compound near Miami, this is it! Adriana De Castro of One Sotheby’s International Realty has listed 90 Leucadendra Drive, Coral Gables, Florida for $29.9 million. For far less than our Splurge you could own a Coral Gables retreat in what the listing calls, “The best area in all of Islands of Cocoplum.” Ideally situated around the corner from a community clubhouse and amenities like a gym, basketball courts, playgrounds, beach volleyball, and tennis courts, you’ll have no shortage of things to do. The six-bedroom, six-full-and-one-half-bathroom estate is known as Villa Rosales, and boasts impeccable architecture, award-winning landscape, and ultra-luxe finishes. Soaring ceilings, marble and wood floors, and ample natural light define the interior, met by a designer gourmet kitchen, and great room for entertaining. But it is the outdoor entertaining spaces that really steal the show. We love the open-air courtyards, the elegant archways, and sparkling resort pool. And although it’s listed without a ton of photos, we expect this Coral Gables beauty wows in person. Aurelio Leyva with Leyva International Realty has listed 140 Rosales Court, Coral Gables, Florida for $4.9 million.